While you may be more familiar with the band he fronts, Houston, vocalist Hank Erix has decided to step out from their shadow for a solo career. Gathering a bevy of strong Swedish musicians, Erix Hank offers his debut solo album, Nothing But Trouble for your listening pleasure. Now, the difficulty of stepping out on your own for a solo album is two-fold. First, most people think that they're going to hear something similar to your main band. Second, and often because the first doesn't hold true, you get what I call the Steve Perry effect. Your name recognition and your voice are your advantage, but that doesn't necessarily promise success, or good music for that matter. You can have, in Perry's case, the success of Street Talk, yet that only brought one memorable single. Or you can have the disappointment of the lackluster For The Love Of Strange Medicine. (I recently revisited the latter and, well, it's boring.) In other words, a solo adventure can be a double-edged sword of promise or pain. Considering, the first point, Houston fans will find Nothing But Trouble similar, but with Erix venturing into heavier AOR melodic rock. In other words, Erix's solo musical choice is offering a bit more edge. The guitar riffs are more brisk and fierce, the leads more roaring, both akin to melodic metal. The bottom end of the rhythm section can also be stronger, yet not replacing the AOR essence of rock rhythm and groove. For his part, Erix may sound even sound more assertive throughout. But, ultimately, and hardly escaping the Houston influence, every song here simply bristles with the accessibility of catchy and entertaining AOR rock. Essentially, Erix has found the delicate balance between heaviness and sweetness, and so delivered some terrific ear candy. As for my "Steve Perry Effect," the short answer is, time well tell. Is there a stand out, straight to the top of the charts, hit single (such as Oh Sherrie)? Not so much. But, overall the strength of Nothing But Trouble is the whole album; every song is solid, viable, and entertaining. That's to say, Nothing But Trouble is definitely not For The Love Of Strange Medicine, far from it. 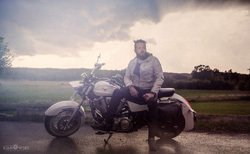 Suffice to say, with Nothing But Trouble, Houston vocalist Hank Erix has delivered his own fine album of engaging and entertaining heavier AOR melodic rock. Easily recommended. My top song picks: Turn To Darkness, Fortune Hunter, Affair Of The Heart, and the only mellow tune, For The Restless And The Young. 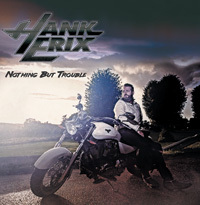 Suffice to say, with Nothing But Trouble, Houston vocalist Hank Erix has delivered his own fine album of engaging and entertaining heavier AOR melodic rock. Easily recommended.